Some people start or join a neighborhood watch, but that means relying on others to be diligent. Some people use a home-security sticker or decal to deter burglars while others rely on their watch dog to alert of an intrusion. While these tactics can help safeguard your home, installing a security system is one of the best methods to protect your home and family. In fact, homes without security systems are 300% more likely to be broken in to than those with an alarm system. On average, a burglary occurs once every 15 seconds. A home security system is the answer to safeguard many families. Installing a security system can provide extra comfort, even if you never need any of your system’s features. If someone does break in, though, security cameras and alarms are strong deterrents. Many burglars run at the first sign of an alarm. If they don’t, the system will automatically call the police for you, so you can stay in a safe place if you’re home when an intruder breaks in. When you integrate your home security system with a home automation system like Control4, it can provide an entirely new layer of security—such as turning lights on or off and locking doors remotely using an app. Additionally, your smart home system can send a push notification, alerting you instantly that someone has accessed your home. 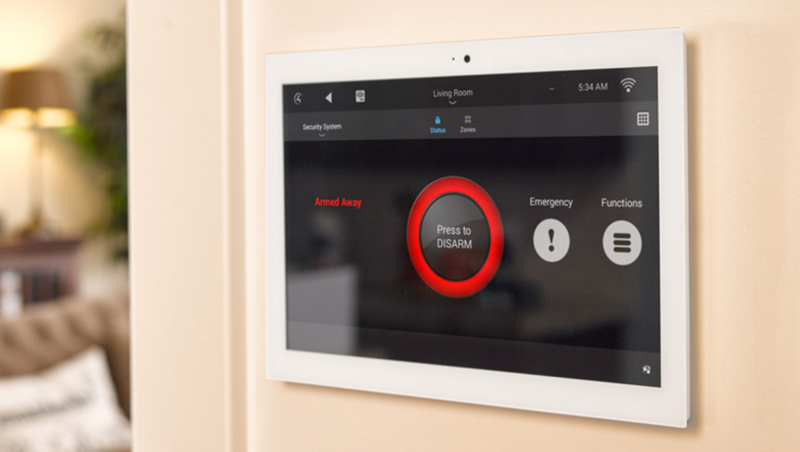 It’s even possible to replace an ugly panel with a beautiful touch screen that allows you to arm or disarm your security system—or even receive immediate emergency assistance—directly from an intuitive user interface. Or even press an “Away” button on a keypad on your way out that sets the alarm, engages the cameras, and lock all doors. A security system can alert you any time someone enters or leaves your house. Apart from thieves, this can be a great feature for those with young kids who might try to open doors when adults aren’t looking. Security systems can also provide other types of monitoring, like detecting carbon monoxide. Every home should have a carbon monoxide detector, as this toxic gas can’t be seen, smelled, or tasted. There are options for a variety of budgets, from simple alarms on windows and doors to complex setups with cameras, 24/7 monitoring, and even flood detectors, so you should be able to find something that works for you. Carefully consider what features your family needs; for example, if you don’t live in a flood-prone area, you can probably pass on flood detectors. That said, keep in mind that a security system can be a nice perk for potential buyers: some people might appreciate having one but not want to go through the process of installing it themselves. You can also save a significant amount on your insurance costs—up to 20% in some cases. This can help offset or justify some of the installation and monitoring costs. If you have pets, there are systems designed to reduce false positives caused by their movement. If you have older family members living with you, many companies offer personal security solutions, like panic buttons that can call for help in case of a fall. And, although security systems generally don’t draw much power, there are solar-powered options for families who want to minimize their environmental impact. Go through this list of questions with any security company you evaluate. These questions will help you get everything you need without getting ripped off in the process. Is there a contract? If so, how long is it? What is the return policy on the equipment? How much is the installation fee? What is involved in the installation? How long will it take? What special features—like apps, remote monitoring, or home automation integration—are included or available to add on? How does the company screen its employees? Where are the monitoring centers? How long is the response time in the event of an emergency? With all of this information at your fingertips, you should be able to successfully decide on a home security system. Use these questions to help streamline the purchase of your system and ease any concerns you might still have.